We’d love to meet you and your group and share a little bit about Hawaii’s culture with you through Hula! Private one-on-one Hula instruction for those wishing to begin or deepen their Hula practice. (Beginners to Advanced Students). Malia Haumschild will lead the Advanced Students. Hula Lessons for small to large groups celebrating Weddings, Bridal Showers. Hula Lessons for Families wishing to have a fun experience and also learn a little bit about Hawaii’s culture! Contact us at (808)264-1358 or Malia@HulaHulaHawaii.com for more info, availability & rates. 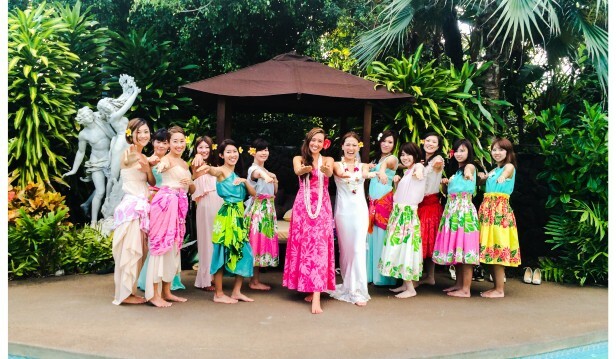 We look forward to meeting you and sharing a joyful Hula lesson with you! I just sent you over a private message. I am Chiaki Gotoh, a student from Japan. I would love to learn Hula in Hawaii. Lerning Hula is my one of the things what I want to do here. see your class what it is like if it is possible. I am very interested in returning to learn the hula. I took hula when I was young, now that I’m older I feel this passion returning in me. My first question us where are you located? We do private lessons only. If you are interested in private lessons, please email us. Aloha! How much would it cost for me, my 21-year old daughter and 3-year old granddaughter to learn one very short dance number? Thank you!